This holiday season, the look is cozy minimal. What does that mean? Clean, metallic, and natural elements all come together to create a fun and modern take on classic design. So ditch the dusty old fake wreaths and red and green ribbons, this year it’s time to do something fresh for your holiday kitchen decor. Consider using white as a base for all of your holiday decorations. Not only does this monochromatic look give a high end finish, but any color accents you use will pop against a background of white. Silverware will sparkle all the brighter against a white tablecloth. A simple candy cane bouquet will look bold and bright when placed in a white coffee mug set on a matching white saucer. Wrap some small boxes in white wrapping paper and add a sprig of rosemary and a cinnamon stick under a glittery white ribbon as a small and easy display for any kitchen surface. Put your credit card away and get out your gardening clippers, because the freshest look you can give your kitchen this season can be found right outdoors. Evergreen sprigs, red holly berries, pears and citrus fruits make amazing centerpiece displays for your breakfast table, kitchen island, or in long strands over the tops of your cabinets. A few sprigs of holly with some greenery in a small glass vase will make for simple and elegant window sill decor. 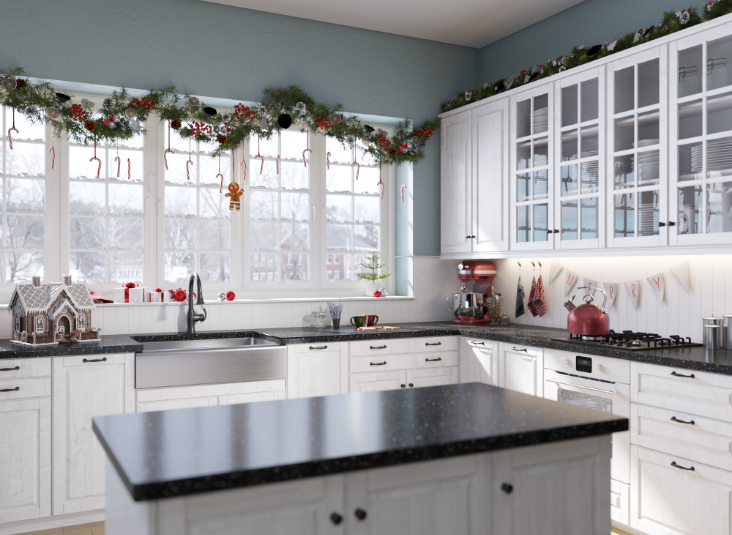 Twinkle lights weaved through evergreen branches, spicy scented candles set out on the kitchen counter, or battery operated tea lights amongst a centerpiece can all come into play when getting your kitchen looking festive and bright this winter. Lights are great for making a space look cozy without overcrowding the room. A candelabra will add all the glamor and sophistication of a chandelier to the family table, without the cost. Use any open shelves or otherwise empty countertops as a place to display small family heirlooms. That gorgeous tea set from your great grandmother that sits up in a cabinet gathering dust can now be front and center. Consider reframing old black and white family photos in simple gold or silver frames to give them new life. Sprinkle some greenery and lights among these pieces, and you’re sure to leave your family in awe.